In the 18th century the Fulanis were a nomadic people originally from Senegal who moved throughout west Africa. Many settled in Hausaland; what is northern Nigeria today. They were a close-knit people who had traditionally lived in close relation to the indigenous Hausas and Taureg Berbers, with whom they traded frequently. Over the years a clerical group focusing on Islamic scholarship had taken root within the Fulani community. The Islamic movement they spawned influenced events throughout west Africa, with alumni becoming leaders of several regional jihad movements in the 18th and 19th centuries. Often described as austere and fanatical reformers, the Fulani objected to the moral laxity of their Hausa rulers and scholars. In the eyes of the Fulani clerics, too many pre-Islamic rituals were being mixed with Islamic teachings by the Hausas, thus they were seen as incorrect Muslims in need of religious purification. The fundamental problem faced by the revivalist leaders was the question of legitimate representation: who was authorized to declare jihad and to lead an emerging Islamic state? Uthman dan Fodio (1754 – 1817), a prolific author and Islamic reformer, was an urbanized ethnic Fulani living in the Hausa state of Gobir in what is today northern Nigeria. He was well-educated in classical Islamic science, philosophy and theology and became a revered religious thinker. Sheikh Uthman was a follower of the Maliki school in law and the Qadiri order in Sufism. In the 1780-90s a wave of messianic preaching had surged through western Africa. Islamic revivalists quickly capitalized by arguing for the necessity of jihad against the Hausa court. They were fixated on religious violations committed by Hausa royals; most controversial was the neglect of the Shari’a (Islamic law based in the Koran) and the Sunnah (Islamic custom and practice based on Muhammad’s words and deeds). Uthman dan Fodio, who had by then mastered the language of legitimation in his teachings, called for a greater jihad (a jihad of the heart–aimed at Islamic purification through spiritual introspection). Sheikh Uthman’s following grew steadily beginning in the 1780s; most were Fulani although he did attract some support from disaffected Hausas and Tauregs. He claimed to have experienced mystical revelations and was closely affiliated with the influential Qadiriyya Sufi jurists. The Qadiriyya gave dan Fodio the impetus for his political movement. Eventually his followers proclaimed him “Leader of the Faithful” conferring on him the political, and religious, authority to declare and wage a military conquest, to raise and command an army of the faithful. By the 1790s his community was seen as a threat to established interests. In 1804, Hausa forces from Gobir reacted by killing several of dan Fodio’s group, whereupon he fled with his forces, proclaimed a new Islamic state and immediately declared lesser jihad (a jihad by the sword) on Gobir. * Inspired by dan Fodio’s declaration of jihad, other Fulanis also revolted against their local Hausa rulers. In 1812 Uthman dan Fodio’s forces finally triumphed over the Hausa state. 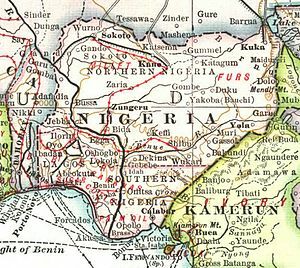 With the successful conclusion of the war dan Fodio was ruler of the largest state in Africa, the new Fulani Empire. Ruling from Gobir, he changed the name of the city to Sokoto. The empire he built became the Sokoto Caliphate. A period of stability in the region followed leading to an economic boom, the likes of which the area hadn’t seen since the sixteenth century. Today Nigeria is Africa’s most populous country. It is composed of more than 250 ethnic groups; the following are the most populous and politically influential: Hausa and Fulani 29%, Yoruba 21%, Igbo (Ibo) 18%. Religious affiliation breaks down as Muslim 50%, Christian 40%, indigenous beliefs 10%. 60% of the population lives below the poverty line with 70% of work in the agriculture sector. The mostly subsistence agricultural sector has failed to keep up with rapid population growth and the country, once a large net exporter of food, now must import food. Under these dire circumstances Colonel Abubakar, the new Sultan of Sokoto, should find fertile ground for recruiting new religious converts. Considering that Nigeria is an OPEC member with 36 billion bbl (2006 est.) proved oil reserves and is nearly evenly divided religiously, one can only hope that the competition for control of the oil doesn’t become another front in the world-wide confrontation between the two faiths. * Uthman dan Fodio no doubt knew the symbolism of framing this episode in the language of the hijra and jihad performed by the Prophet Mohammad’s original community. Revolutions in the Western Sudan. David Robinson.